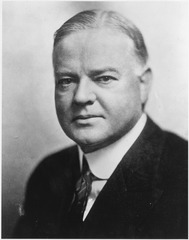 In his acceptance speech eight weeks after the convention ended, Secretary Hoover said: "We in America today are nearer to the final triumph over poverty than ever before in the history of this land... We shall soon with the help of God be in sight of the day when poverty will be banished from this land." The phrase would eventually haunt Hoover during the Great Depression. 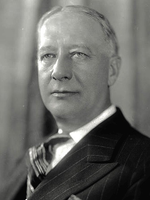 The Prohibition Party Convention was held in Chicago from July 10 through July 12. 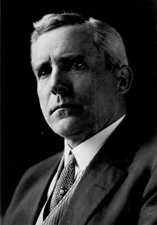 Smith openly opposed Prohibition. 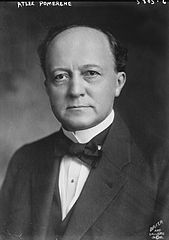 Some members of the Prohibition Party wanted to throw their support to Hoover, thinking that their candidate would not win and that they did not want their candidate to provide the margin by which Smith would win. 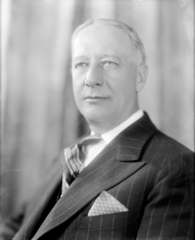 [ citation needed] Nonetheless, William F. Varney was nominated for president over Hoover by a margin of 68–45. 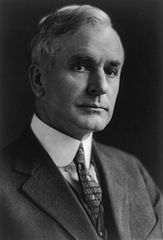 Hoover won the election by a wide margin on pledges to continue the economic boom of the Coolidge years. 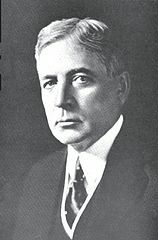 He received more votes than any candidate of the Republican Party previously had in every state except five: Rhode Island, Iowa, North Dakota, South Carolina, and Tennessee. 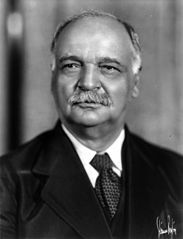 The Hoover vote was greater than the Coolidge vote in 2,932 counties; it was less in 143 of the comparable counties. 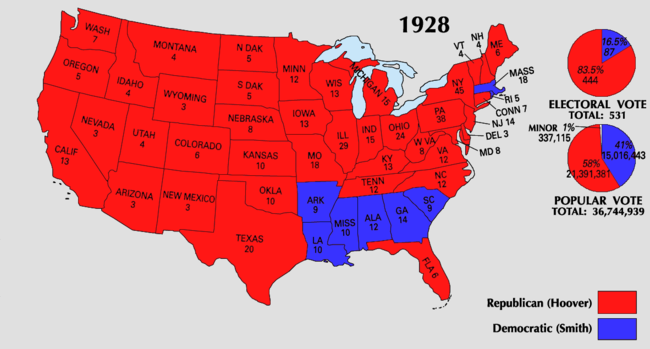 The 21,400,000 votes cast for Hoover also touched the high-water mark for all votes for a presidential candidate up to that time and were an increase of more than 5,500,000 over the Coolidge vote four years earlier. 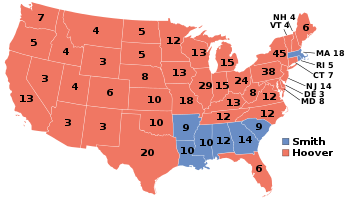 The Republican ticket made substantial inroads in the South: the heaviest Democratic losses were in the three Southern sections ( South Atlantic, East South Central, West South Central). These losses included 215 counties that had never before supported a Republican presidential candidate, distributed as follows: Alabama (14), Arkansas (5), Florida (22), Georgia (4), Kentucky (28), Maryland (3), Mississippi (1), Missouri (10), North Carolina (16), Tennessee (3), Texas (64), Virginia (26), West Virginia (4). In Georgia, eight counties recorded more votes cast for "anti-Smith" electors than either of the two-party candidates,  while one county in Wyoming had no recorded votes.